COST for both culinary and musical gourmandise is $49, with advance reservation requested. The musical aspect only, is $18 in advance and $20 at the door. 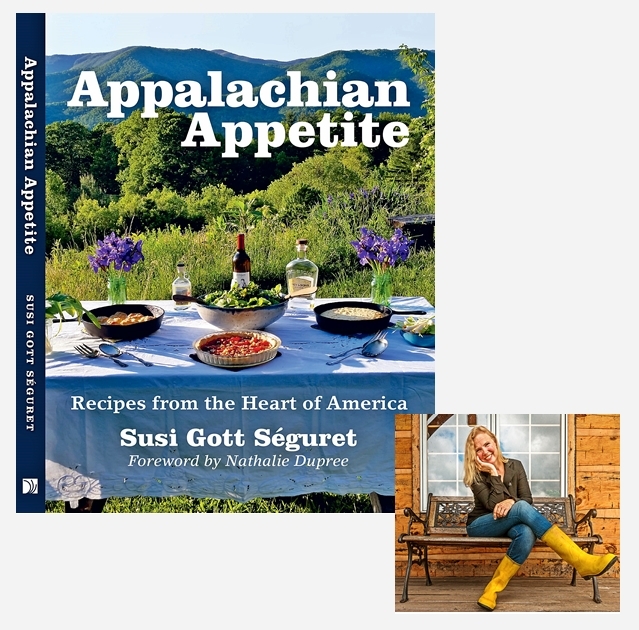 Appalachian Appetite is a groundbreaking new cookbook featuring over 100 recipes that represent an innovative take on tradition, with contributions and stories from many of the mountain region's best chefs, restaurants, and citizens. From Asheville, North Carolina to Nashville, Tennessee, and from Oxford, Mississippi to Millinocket, Maine, when asked which cuisine most typifies America, chefs are bound to tell you it stems from the South, the heartbeat of which is Appalachia. Appalachian Swing is a musical ensemble comprised of the author, Susi Gott, the Sons of Ralph, and bassist Bud Davis. Food and music in Appalachia have always been intertwined, as illustrated in the titles of a multitude of fiddle tunes and ballads: “Bile ’em Cabbage Down”, “Groundhog”, “Old Joe Clark”, “Mountain Dew”, “Cornbread, Molasses & Sassafras Tea”, “Shortenin’ Bread”, “Walkin’ in My Sleep”, “Leather Britches”, “The Crawdad Song”, and endless others. 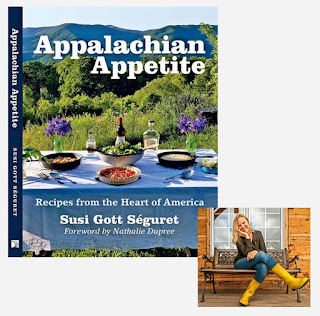 Author SUSI GOTT SEGURET hails from the very depths of Appalachia in Madison County, North Carolina and honed her culinary skills in France, where she resided for over 20 years, earning a diploma in Gastronomy and Taste from the Cordon Bleu and the Université de Reims. Passionate about elements of taste and style, and how they extend from our palate into our daily lives, Susi strives to blend food, music, words and images into a tapestry for the senses. Also an award-winning fiddler and songwriter, Susi has toured extensively across the United States and Europe, Africa, South and Central America. In the mid-’80’s she participated in the Masters of Bluegrass tour, accompanying Bill Monroe, Jim & Jesse, Ralph Stanley and Mac Wiseman, with appearances at the Kennedy Center and on numerous TV and radio programs. Assistant Director of ETSU’s Old-Time, Bluegrass and Country Music Program in the late ’90’s, Susi has also collaborated on movie scores, and has performed at Paris’s Olympia Theatre. MARTY LEWIS is a gifted and prolific songwriter whose music has been recorded by Sons of Ralph, Open Road, Norfolk Southern Lawmen, 40 West, and The Lids. As a child, Marty and his brother Don toured with their father and Bill Monroe during school breaks as the youngest Bluegrass Boys, including an appearance at the Grand Ole Opry. Marty has performed with Chubby Wise and Kenny Baker, Vassar Clements, and Hank Thompson, and has recorded with numerous other groups. On stage, he is relaxed and smiling behind his guitar, singing ballads he composed about people and places he knows, such as his beloved Madison County, followed by virtuoso renditions of Southern rock classics. He has recently been featured in several musical theatre pieces including Crowin’ Hen, The Great American Trailer Park, and Southbound. DON LEWIS started his music career at age 5, first playing the mandolin then graduating to the fiddle by age 10. The Lewis brothers’ first band was Ralph Lewis Family and Friends, formed when they “hired” Ralph away from Bill Monroe. In the 1990's Don toured Europe with the Shady Grove Band and played with the Red Clay Ramblers on Broadway. His talent and musical versatility caught the attention of Michael Bogdanov, legendary British director of Shakespeare plays. Bogdanov hired Don and fellow Red Clay Rambler Jack Herrick to compose and perform the score for the BBC Wales film, “A Light on the Hill” (2000). Some of Don's career highlights include performing with Rhonda Vincent at the Grand Ole Opry, appearances on Hee Haw in the 1980s, and recording credits with Warren Haynes, Doc Watson, the Red Clay Ramblers, the Shady Grove Band, Roy Clark, and Ronnie Milsap. In recent years, Don has remained a wild card, performing with Sons of Ralph and various bands around Asheville. RALPH LEWIS was part of a musical family, the seventh son born of another seventh son, and picked up mandolin and guitar at an early age, appearing with his siblings as The Lewis Brothers, and later with The Carolina Pals and The Piney Mountain Boys. In the 1970’s he joined Bill Monroe and the Bluegrass Boys and toured Europe, Japan, and the United States, and appeared regularly on the Grand Ole Opry. In more recent decades he and his sons Marty & Don have been Asheville mainstays, performing widely as The Sons of Ralph. Adept at both the high lonesome sound of bluegrass and the rhythms of rock and roll, as well as the haunting melodies of country, Ralph’s music sounds as if it were carved out of the mountains themselves. PETER GOTT made Madison County his adopted home in the early 1960’s, when both he and Ralph performed regularly at the Jubilee Theater in Hot Springs, filling the hall each Saturday night, Peter capturing the audience’s heart with his banjo and red suspenders, infectious smile and nimble dancing feet. Peter’s passion for the music of the area led him to seek out the true gems of the back hollers, learning tunes and ballads from Lee, Doug, Cas & Berzilla Wallin, Lloyd & Dillard Chandler, George Landers, Dellie Norton, Byard Ray, and others of their generation. In 1963 he introduced John Cohen to these friends and neighbors, and the result was two classic recordings: Love Songs & Ballads of Big Laurel (Folkways), and High Atmosphere (Rounder), which lured the next wave of folk musicians who flocked to Madison County. Peter and his wife Polly were a stopping point for artists from the north and from the west who wanted to soak up southern culture: The New Lost City Ramblers, Alice Gerrard & Hazel Dickens, Alan Lomax, Mike Seeger, David Holt…Also a master log builder, Peter has built hand-hewn cabins all around the world. BUD DAVIS has graced many stages with a variety of WNC legends over the years. His brother Randy Davis accompanied Bill Monroe during the years that also included Ralph Lewis. Comfortable with multiple styles, he rounds out both the band and the table.